Smart Materials Market is expected to garner $72.63 billion by 2022, registering a CAGR of 14.9% during the forecast period 2016-2022. Smart materials are adaptive or intelligent materials which pose intrinsic and extrinsic capabilities. These can be altered by external stimuli, such as moisture, temperature, electromagnetic field, and pressure to obtain the desired functional effects. In addition, these materials are dynamic in nature and respond to their immediate interaction environments by adapting their characteristics. Advancements in the materials science sector resulted in the development of materials for specific applications, which was previously not possible with the use of conventional materials, such as polymers/plastics, metals, glass, and ceramics. Smart materials are capable of working at a very basic functional level, such as temperature and can be used in very complex technical systems by incorporating additional functionalities and properties. For instance, smart materials can be used in energy supply systems for microelectronic components. Smart materials are used in applications, such as transducers, actuators & motors, and structural materials. The market for smart materials is driven by the rise in adoption of smart materials products among various end-user industries, such as defense & aerospace, automotive, and consumer electronics; supportive government initiatives & plans; and increase in R&D investment by prominent players to optimize the cost and quality of smart materials. There is a high demand for smart materials on account of potential growth in emerging economies as well as evolution in Internet of Things (IoTs). The value chain of smart materials observes the presence of large number of stakeholders from the raw material providers to final end users. Each of these stakeholders share a specific value at their point of operation, and in turn, contribute to the competitive value of the product. R&D activities, innovations, and marketing strategies further enhance the value associated with end-deliverables by each player, who operate in the global smart materials industry. 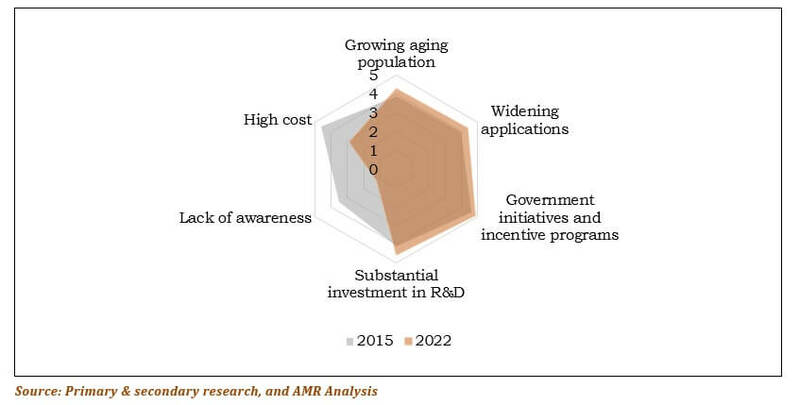 Smart materials have increase in gaining traction in older population-centric products. In addition, these products help reduce daily routine complexities and make life easier for old people. In near future, population share of this age-group is projected to increase at significant rate which in-turn is anticipated to increase demand for smart materials products. According to an International Population Reports, 2015 published by United States Census Bureau, the population increase of older population is projected outpace that of younger population over the next 35 years. Thus, the overall impact of this factor is projected to be high by 2022. Continuous development in manufacturing processes and adoption of enhanced materials has increased the applications of smart materials across various end-user industries. By 2022, smart materials are projected to further expand their applications and is anticipated to play pivotal role in the smart materials market growth. Hence, the impact is projected to be high throughout the forecast period. Currently, some specific group of industries, such as small and medium enterprises (SMEs) lack in terms of adoption of smart materials due to high cost. Introduction of several initiatives and programs to encourage industries to invest in and utilize smart materials is projected to impact throughout the forecast period. Increase in demand for enhanced smart materials and products from various industries, such as construction, manufacturing, and automotive are anticipated to encourage key players operating in the smart materials market to invest considerable amount on research and development to introduce efficient products and stay ahead in the competition. The market is segmented on the basis of application, end-user industry, and geography. By application, it is divided into transducers, actuators & motors, sensors, structural materials, and coatings. Based on end-user industry, it is classified into industrial, defense & aerospace, automotive, consumer electronics, healthcare, and others (civil engineering and retail). The global smart materials market is classified based on geography into North America, Europe, Asia-Pacific, and LAMEA. Actuators are the components of machine that respond to change in mechanical property, such as viscosity or dimensional change. For instance, a simple amplifier which converts low energy signal into high energy signal. Smart materials, which include shape memory alloys, magnetostrictive materials, piezoelectric ceramics, and magnetorheological/electrorheological fluids are integral parts of actuators. On the other hand, motors are also actuators that convert electrical energy to mechanical energy through the production of continuous angular rotations. Loudspeakers are used as acoustic actuators for active noise control applications. Pneumonic and hydraulic actuators are frequently found useful when large force, low frequency, and displacements are required, while the shaker/electromagnetic actuator are used to respond against an inertial electrodynamic mass. Actuators have the potential to enhance vehicle performance and fuel economy to ensure convenience and comfort. In actuation technologies, shape memory alloys are used for tight-integration and small-scale applications, such as in small-displacement tensile motors. Nowadays, actuators have become an inseparable part of robotics where pedal motors, manipulator joint motors, deployment motors, drive/steering motors, and sampling tool motors are used. Key players are inclined to enhance, design, and develop process of actuators to make actuator compatible with wide range of applications. This report provides an in-depth analysis of the global smart materials market size to elucidate opportunities. Current smart materials market trends and future estimations are outlined to determine the overall market potential and single out profitable trends to gain a stronger foothold. A quantitative analysis of the smart materials market share from 2016 to 2022 is provided to highlight the financial competency. The segmentation of the smart materials market based on application, end-user industry, and geography is as below. The world smart material market is projected to grow at a steady rate during the forecast period. Asia-Pacific is the highest revenue-generating region and is expected to grow at the fastest CAGR during the forecast period, owing to high adoption of smart materials in various applications such as transducers, actuators & motors, and structural materials. The market for transducers in Asia-Pacific is projected to grow at the fastest CAGR owing to widening applications of transducers in defense & aerospace and industrial sector. In addition, increasing government spending on smart devices and supportive government initiatives to encourage small- and medium organizations to invest in smart materials accelerate the adoption of these materials in the emerging regions such as Asia-Pacific and LAMEA. Smart materials have gained huge popularity in various end-user industries such as construction, manufacturing, and automotive, owing to heavy industrialization in developing economies such as China and India. Furthermore, increasing use of smart materials in healthcare and defense & aerospace is anticipated to create significant growth opportunities for key players. Key players are projected to emphasize on product innovation and make them available at affordable price to various types of organizations. These players are anticipated to concentrate on acquisitions & mergers to increase their global footprints and profit margins. In addition, significant investment on R&D activities is projected to boost the growth of various smart materials such as piezoelectric and sharp memory alloy demand in the market.